Secret Agent Clank (known as Clank & Ratchet: Mission Ignition in Japan) is a platform game developed by High Impact Games for the PlayStation Portable and published by Sony. It was first released in North America on June 17, 2008. A PlayStation 2 version was ported by Sanzaru Games and was released on May 26, 2009 in North America and in Europe on June 19, 2009. The game is the first (and only) to feature Clank as the main character. It is a spin-off game of the Ratchet & Clank series, and the official sequel to Ratchet & Clank: Size Matters. As the title suggests, the theme of the game is a spoof of the James Bond series, though it is technically based on the Secret Agent Clank element of Ratchet & Clank: Up Your Arsenal. 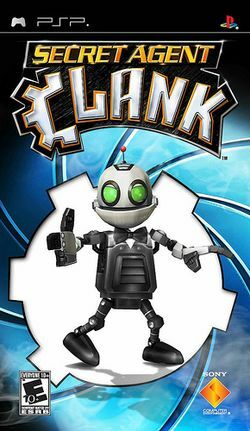 To fit with the James Bond theme, Clank has an array of helpful gadgets and devices on his tuxedo, such as a bow tie that he can use as a boomerang, and a rose that turns into a carnivorous plant to devour enemies. This page was last edited on 10 July 2016, at 02:49.